It's time for new dentures! Denture fabrication usually takes 5 visits over a 4-6 week period. Additional visits and time may be needed depending on your specific type of treatment. Appointment 1: Preliminary impressions are taken for diagnostic purposes and a custom tray is fabricated. This impression is not accurate enough to make the denture. Appointment 2: Final impressions are taken in the custom tray. This provides an accurate representation of your mouth and the dentures are made on these models. Appointment 3: Measurements and bite registration is taken along with selection of the teeth for size, shape, and color. Any requests for special positioning of the teeth should be made at this time. Appointment 4: The dentures will be placed in the mouth to check that the bite is correct and the cosmetic appearance is acceptable. Since the denture base is wax, the dentures will be loose, rough, and bulky. This appointment is to only check the teeth and fit is not considered. Additional visits may be needed if any changes are required. Appointment 5: Delivery of dentures and homecare instruction. The number of post-delivery adjustments may vary depending on the type of denture and the shape of the mouth. Adjustments during the first 30 days are included in the fee for the denture. Adjustments after the first 30 days may incur a $45.00 fee per visit. Fit: New dentures may feel loose for the first 24-48 hours. As dentures are worn, the gum tissue will conform to the shape of the new denture base and retention will improve. Upper dentures develop suction in most cases. However, lower dentures do not develop suction and will always move around. It will take time for you to train the cheek and tongue muscles to control the movement of the lower denture. The use of a powdered adhesive will offer extra retention during the adjustment period. DO NOT PLACE OLD DENTURES BACK IN YOUR MOUTH! The gum tissue needs to conform to the shape of the new denture and switching back to the old dentures will compromise the fit of the new dentures. Fullness: To compensate for the loss of the teeth and bone, new dentures will be larger and feel very bulky at first. To overcome the feeling of fullness, the use of a hard candy (sugarless) will help. Sucking on hard candy will get the tongue and cheek muscles moving. The more you work with the denture, the quicker the feeling of fullness disappears. Difficulty Speaking: Changing the shape of your mouth may alter your speech patterns. If this occurs, the best way to improve your speech is to read out loud. Practice saying the sounds that give you the most difficulty. Difficulty Chewing: Your new dentures will have the best bite possible. However, some difficulty may occur with chewing. This is because the muscles that control the movement of the lower jaw need to adapt to a new bite position. Meals should consist of softer foods cut in small pieces. Gradually work up to your normal diet. Sore Spots: You will most likely develop some irritation to the gum tissue from the denture base. Unlike the feeling of fullness, difficulty speaking, and difficulty chewing, sore spots will not go away with time. It will be necessary to return for adjustment visits to relieve soreness caused by the dentures. Most times it will take only two or three adjustments over the first two weeks to make the dentures comfortable. As a courtesy, there is no fee for adjustments during the first 30 days after delivery. YOU MUST WEAR THE DENTURES AT LEAST 12 HOURS PRIOR TO YOUR VISIT. Wearing the Dentures: The gum tissue was not meant to be covered 24 hours a day by the denture base. It is best to take the dentures out while you are sleeping. Any time the dentures are out, store them in water. If the dentures are not kept moist, the denture material will dry out and become brittle. If you are in the habit of sleeping with your dentures, please take them out sometime during the day for an hour. This will allow the gum tissue to breathe and be bathed by the saliva.For additional retention, you may use a powder denture adhesive. Avoid paste adhesives as they may interfere with the seating of the denture.Dentures are to be worn as a matched set. Do not interchange new dentures with older sets. The bite will be incorrect which may result in damage to the dentures. Care of Dentures: After each meal if possible, take the dentures out and rinse. Food particles can become trapped under the denture base. Prior to going to sleep, clean the dentures with a denture brush. Soaking the dentures in any over-the-counter cleaning agents will freshen the denture base and remove any light staining, but will not remove the sticky plaque that collects on dentures. Brushing the dentures is the best method for cleaning. Annual Examinations: All full denture patients should be seen once a year. We will send you a recall card for your annual examination. At that visit, the dentures are ultrasonically cleaned, adjustments done if needed, and an oral cancer screening will be performed. Patients with partial dentures will be scheduled for periodic examinationsaccording to the periodontal needs of the remaining teeth. It is important to keep natural teeth and the gum tissue healthy. Additional tooth loss can compromise the retention of the partial and could require premature replacement. Relines and Replacing Dentures: Due to continual bone loss, dentures will become loose over time. When this occurs, full dentures can be relined. The average time for relines is 4-5 years after delivery. Full dentures should be replaced in 8-10 years. Partial dentures may need to be replaced in 7 years. It may not be possible to reline partial dentures. Certain circumstances such as immediate dentures, weight loss or gain, or additional tooth loss may result in relining or replacing dentures sooner than expected. Repairs: Dentures can be damaged if dropped or if an abnormal biting force is applied. Do not use home repair kits or crazy glue to fix a broken denture. This may result in permanent damage requiring replacement of dentures. For your convenience, our in-house denture laboratory can perform most repairs in one hour. For repairs or adjustments, please call the office for an appointment. Welcome to Valplast Supply Services! 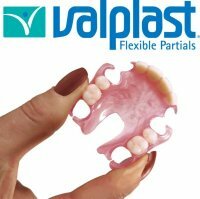 Visit the Valplast Supply Services website, your source for Val-Clean brand Concentrated Denture Cleanser, the new Sonic Denture Spa, and more products available soon for home denture care specially designed and recommended for Valplast Flexible Partials and ideal for all acrylic dentures and most partial dentures containing metal. Call today for your complimentary denture consultation!